Musical theatre is almost embarrassingly sincere. While there are exceptions, on the whole its resolutely innocent humour and reverence for even the corniest, most dated classics can make it hard to get on board the all-singing, all-dancing, all-feeling train. One of the worst examples of the genre is Calamity Jane, the cringe-worthy little sister to Annie Get Your Gun. Originally a movie musical vehicle for Doris Day back in 1953 it’s a sweet little Western about a real-life rough and tumble woman, though the musical removes any remaining traces of grit from her story; she learns to become more of a “lady” so she can be happy in love. It’s toothless and meandering and too cute for words; while it was adapted for the stage in the early 1960s, not even Broadway, the natural home of musical theatre cheese, has ever put Calamity Jane in one of its theatres. Thankfully, Richard Carroll’s new production of the show (which was originally conceived as a staged reading as part of the Neglected Musicals series) has no interest in worshipping the old bird. He and his cast give the show as much respect as it deserves in 2017: very little. Instead, it’s a quick-fire, self-aware, fourth-wall-breaking beast; a madcap staging that veers from droll to camp to slapstick and back again. And it’s the most you’ll laugh during any musical currently playing in Australia (including The Book of Mormon). Virginia Gay stars as Calamity Jane, Deadwood’s self-styled protector: a woman who dresses like an outlaw and is fond of exaggerating her exploits as a local scout, spinning yarns of fighting, shooting, and riding to impress fellow residents. She might be awkward and inexperienced in love, but when she’s got her swagger on, trying to impress someone beautiful, she’s the pansexual butch of your dreams. Calamity has a soft spot for the very pretty Lieutenant Danny Gilmartin (Matthew Pearce), but she’s got affection for all the regulars at Henry Miller’s Golden Garter Saloon, from proprietor (Tony Taylor) and his niece Susan (Sheridan Harbridge), to her good-natured rival, Wild Bill Hickock (Anthony Gooley). When Miller’s latest traveling act turns out not to be Frances Fryer, the infamously beautiful actress, but Francis Fryer, an earnest male actor, his patrons revolt. In an attempt to smooth things over, Calamity bumbles her big mouth into a promise: the saloon’s next guest will be cigarette-card pin-up girl Adelaide Adams. Before the townsfolk turn on Miller, she’s off to “Chicagie” (Chicago) to sweet-talk the star into singing for Deadwood. Of course, it’s more or less another Fryer situation: instead of Adelaide (Harbridge again) she finds maid Katie Brown (Laura Bunting) in the vamp’s dressing room. With one look at Katie, Calamity has a giddy crush; how could Katie be anyone but Adelaide? She’s the prettiest girl Calam has ever seen! Katie jumps at the opportunity to be a star somewhere in the world, and together they’re off to South Dakota. 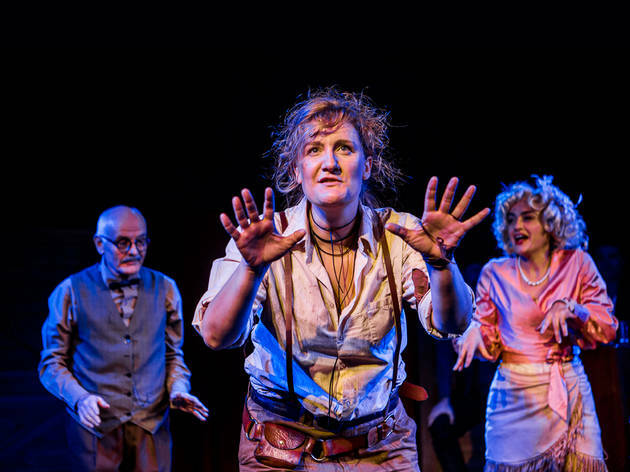 The second act opens with Calamity and Katie moving into a cabin together as they sing about a ‘A Woman’s Touch’, and Carroll’s production plays up the queer love connection with delight. It isn’t the first time that this relationship has been read as queer, but Gay’s performance is so open-hearted, and her and Bunting’s connection so tender, that you can’t help but wish the story didn’t have to end the way it’s written (which is not, as you can imagine for a show from the 1950s, with queer domestic bliss). Everyone seems a little in love across gender boundaries; all attempts to have Calamity act more ladylike seem more like suggestions than righteous haranguing, and even outlaw Bill Hickock seems more entertained by the “Wild” epithet than anything else. Gooley is droll and immensely likeable here, and he’s always too faintly amused by the world to be irritating, even when he’s telling Calamity to wear dresses. Production designer Lauren Peters has created a semi-immersive experience; we enter onto the old-timey set to find our seats – some of which are onstage – and audience members are briefly, but never humiliatingly, drafted into the action. A cast of seven tackles the entire ensemble with a wink and a nod (keep an eye out for improv comic and music theatre performer Rob Johnson, who brings an element of suppressed madness to Francis Fryer and other cameos, and Sheridan Harbridge, whose humour is so quick and so accomplished she can make you laugh with a single gesture). For all that this is a raucous, frequently anachronistic joke fest (you might hear Deliveroo, the recent Oscars debacle, or All Saints references as they fly by), Gay brings enormous heart to the show. 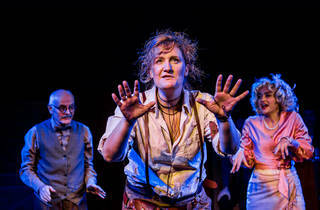 Her Calamity is a brash, vulnerable woman who doesn’t quite fit the role she’s expected to play in her society. She wants to love as much as she wants to tussle, only she doesn’t quite know how to do that and still retain her tough-girl credibility. Gay embodies that struggle without ever letting it become maudlin; she is one of our most gifted comedians precisely because she grounds her humour in an unassailable humanity. Her voice is rich and sensitive and beautiful, treated here with a folksy twang that tugs at heartstrings; this unfiltered emotion is an essential counter to her broad physical comedy. With the economy and wit of Cameron Mitchell’s choreography creating a sense of space on the small stage, packed with plenty of quick visual gags (especially an extended, reference-heavy dance break by a desperate Francis Fryer), complemented by Trent Suidgeest’s cleverly atmospheric lighting design and Peters’ dress-up-box costumes, the world of Calamity Jane is irresistibly playful. Carroll’s production is ‘unplugged’ – Nigel Ubrihien consolidates the score for a solo piano (although when it’s necessary, the cast fire up an accordion, a ukulele, or a tuba) and the performers are un-mic’d – and it helps give us that rustic, roughshod feel. A couple of quieter lyrics might get lost, but the trade-off is worth it for this ensemble of vibrant voices and fearless comic actors; it feels right for a show about the wild frontier to be acoustic. If you love musicals, don’t miss this loving send-up of the form, packed with its funniest actors. If you hate musicals, this is the one to see – it knows exactly why you hate them, and is likely to win you over to the cause. Let’s hope Carroll directs more classics in this vein; it’s the kind of shake-up the genre sorely needs.